This beautifully restored traditional style brick front home is located in the family friendly desirable Walden Park in Mountain Top. 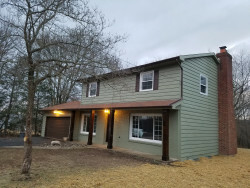 It has many new upgrades including two HVAC units, roof, stainless steel appliances, PEX water supply manifold system, GE high capacity water heater and many more! This house boasts 5 huge bedrooms, 3.5 baths, ultra modern cherry kitchen with level 4 granite, slow close cabinets and drawers, LED lights and hardwired Bluetooth stereo system. The basement is finished with a bar and large utility room . Storage abounds starting with the two car garage with built in shelves, a walk up attic, the basement utility room plus oversized closets in every bedroom in this 3,304 square foot home. Relax in your master suite and bathroom with double sinks & custom tile with a huge walk in closet. YES, this master bath even has its own hardwired Blu-tooth system so you can sing your favorites while showering! Entertain family and friend in your private backyard oasis where you can enjoy the oversized 12'x30' deck - its a must see! This property is conveniently located within minutes of Interstate 80 and 81. Call or text Pam McGovern at 570.905.4098 to schedule a tour. The completion date on this project is MAY 29, 2015. Be the first to see what this awesome property has to offer! Fully refinished and remodeled 1920 SqFt 3 bedroom, 2 bathroom house. Features include a granite kitchen, off street parking, walk out basement with tons of storage areas! © Neighborlee Homes LLC All Rights Reserved.